Today, what we see happening in the Middle East with the rise of ISIS is nothing new. In fact, centuries ago, what is now India, Pakistan and Afghanistan suffered under a fanatical, oppressive regime known as the Mughal Empire. During the course of the Mughal Empire, a spiritual-social movement began teaching basic human freedoms, including the freedom of people to practice their religion as they choose, the equality of all people – including women and men, and the right for people to earn an honest living for themselves and share their earnings with others. This movement began with a teacher named Guru Nanak (1469-1539) and continued with nine successive teacher/leaders over the course of 240 years. Based on meditation, social consciousness and eventually incorporating its own unique martial tradition of “defend but do not attack” – the movement became known as Sikh Dharma. During the time of the 10th teacher, Guru Gobind Singh (1666-1708), the Mughal oppression reached new and terrifying depths. In the regions under the protection of Guru Gobind Singh, people felt free to practice their own religion, ignore the caste system, and freely work and trade with each other. The Mughal Emperor Aurangzeb, threatened by this “rebel” society, conspired with the local hill kings of the area to destroy Guru Gobind Singh’s center of power. In 1704-1705, for eight long months, the troops of Aurangzeb laid siege to Anandpur Sahib, the capital city of Guru Gobind Singh and the Sikhs. As the Sikhs died of starvation inside the fort, the Mughals offered a deal. They would stop the siege and the Sikhs could peacefully leave. However, the Mughal promise was false. When the Sikhs, the Guru and his family left the fort, the Mughals descended and attacked – killing everyone they could. For many weeks after, the the troops of Aurangzeb continued to pursue Guru Gobind Singh and a very small contingent of soldiers who stayed with him. The pursuit was relentless, and it is reported that a Mughal troop 16,000 strong participated in the chase. Many of the Sikhs deserted the 10th Sikh Leader during this time. There is one story that, at the Guru’s request, 40 men actually signed a document renouncing Guru Gobind Singh as their teacher and leader. The story of these 40 deserters is where Mai Bhago comes into the picture. Not much is known about the life of Mai Bhago (Bhago Kaur). We know she was born in the late 17th century in a village called Jhabal, outside Amritsar, in modern day northern India. Her father, Malo Shah, trained and fought under the sixth Sikh teacher, Guru Hargobind (1595-1644). Mai Bhago received martial arts training herself. However, in her younger years, she did not engage in any battles that we know of. One of the reported 40 men who deserted Guru Gobind Singh and signed the letter of desertionwas Mai Bhago’s husband, Nidhan Singh Patti. The story goes, that when he returned home and told his warrior wife what he had done, she became furious. She ordered her husband to stay home and take care of the house while she rode into battle herself. Mai Bhago wanted to defend an entire way of life that had been created over 240 years. A life where equality, freedom and social justice mattered. Mai Bhago took her horse, armed for the fight. Her husband, ashamed of his actions, joined her. It is said they rode to the homes of the other deserters. Mai Bhago asked the wives to kick their husbands out of their houses if they would not return to fight. Some of the wives even donned their own armor, ready to do battle themselves if their husbands would not join. After weeks of pursuit, the 16,000-strong Mughal troops were exhausted and thirsty. Guru Gobind Singh with his small band of bodyguards had managed to elude capture, and the troops could not go much further. Mai Bhago and the 40 deserters knew where Guru Gobind Singh was hiding. They set up camp in front of a well in a town called Khidrana. The well was the only reported source of water in the area, and the 16,000 troops, dying of thirst, were headed right for it. The Mughals did not know the well was dry and there was no water to be had. Mai Bhago and her 40 men created a trap. They spread out their clothes among the trees to look like they had more people than they actually did. And they made the Mughal troops fight bitterly to get to the well. Mai Bhago and the Sikhs knew it was a suicide mission. But they wanted to distract the troops from pursuing Guru Gobind Singh, who had taken position in a nearby jungle. The battle raged fiercely. The unique Sikh martial arts of the era reportedly allowed one man to successfully defend himself against dozens, if not hundreds, at a time. But even still – the odds were against the Sikhs. Many Mughal soldiers fell during the battle, but every single Sikh was killed. When the Mughal troops finally got to the well and realized it was dry, they mutinied. The Mughal leaders assumed that Guru Gobind Singh’s body was among the dead, but did not wait to find it. Instead, they turned around and left the battlefield in search of another source of water. Mai Bhago was the only Sikh survivor of the battle. 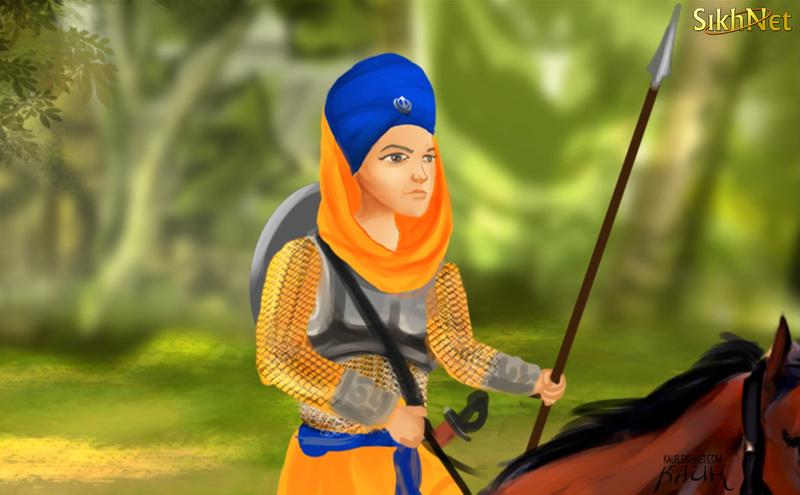 She became the personal bodyguard of Guru Gobind Singh. 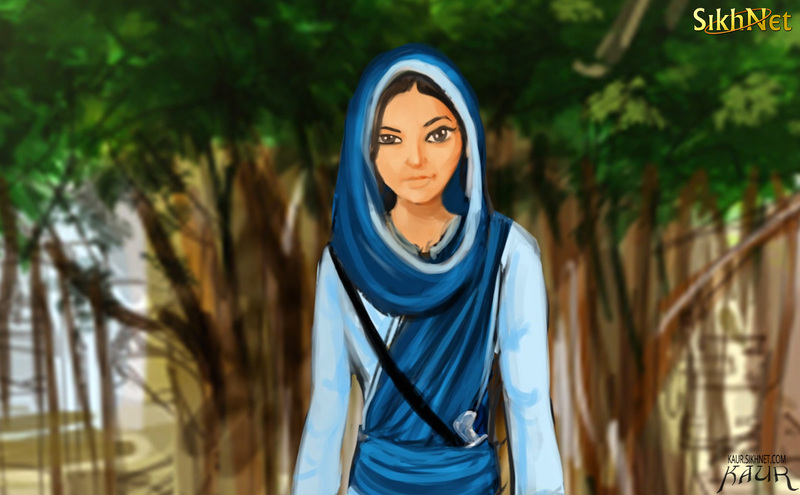 Her bravery and her strength turned the tide in one of the most critical and climactic pointsin Sikh history. This is a unique episode where the crucial leadership of one Sikh helped saved the Guru. Without the intervention of this one brave woman, Mai Bhago, who knows how Sikh history would now be written. After this fight – which came to be known as the Battle of Muktsar, the Mughal pursuit of Guru Gobind Singh completely stopped. The 40 deserters who died are said to have been liberated by their sacrifice. In the years after this battle, Guru Gobind Singh established one last Sikh center in Nanded, in the southern part of India. It was there, before he passed away, that Guru Gobind Singh left instructions that havegiven rise to what we know as the fifth largest religion in the world today – Sikhism. 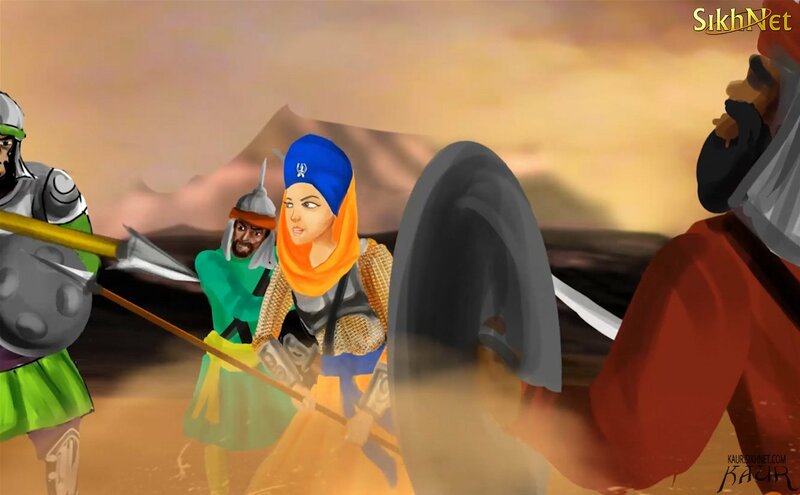 SikhNet is proud to bring her story to modern audiences around the world through the original animation KAUR via the world-wide-web in honor of International Women’s Day. kaur.sikhnet.com.